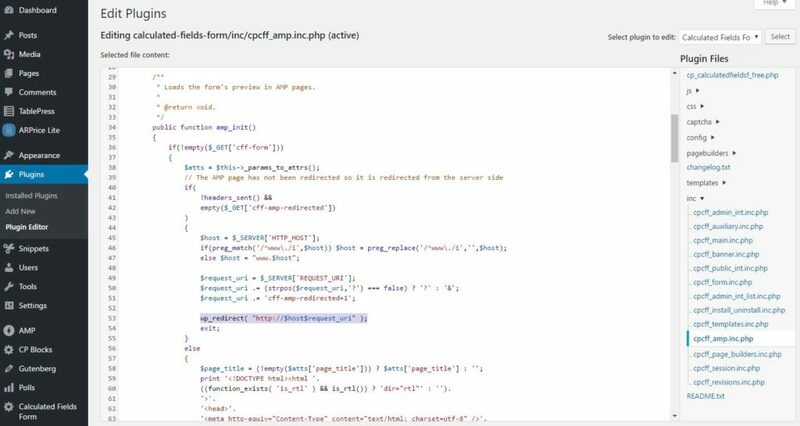 If you have an AMP WordPress website and Calculated Fields Form (CFF) plugin, you may be aware that your forms actually don’t load on the AMP pages this is a cause for concern with user’s experience resulting in them leaving. I was first made aware of this issue in Google Search Console formerly known as Google Webmasters after seeing URL not found (404) errors for AMP. After viewing a few of my posts that contained forms I noticed it was caused by the Calculated Field Forms plugin itself. The plugin would try to redirect AMP pages to a HTTPS link. And since I do not have SSL enabled on this website as there is no reason to, this is not good for users visiting posts that have forms. After trying to search for fixes I stumbled across a very unhelpful post by the plugin developer themselves. Not satisfied with this I set out to fix the issue myself. All it took was a simple small edit of the cpcff_amp.inc.php from the Plugin Editor. From the Plugin Editor page select Calculated Fields Form from the drop down list of plugins to edit. Open up the cpcff_amp.inc.php file from the Plugin Files sidebar. Once you have made the change click Update File to save the changes. NOTE: You will need to do this again every time you update the plugin.